(Bloomberg) -- Uruguay’s 152-year old bourse is considering a bid for its emblematic headquarters in Montevideo’s historic financial district as it looks to cut costs. The Montevideo Stock Exchange, or BVM, is weighing an unprompted offer received last month for the iconic building, said chairman Angel Urraburu in a telephone interview, declining to name the buyer. BVM and the building’s majority owner, the National Chamber of Commerce and Services, both need to agree the sale, which they want to complete as soon as this quarter, he added. The chamber of commerce didn’t respond to phone calls and messages seeking comment. The move comes as BVM’s relevance in the local capital market has shrunk, leading the exchange to lose money since at least 2013. Almost 50 companies traded on the exchange during the first half of the 20th century, but waves of foreign takeovers, bankruptcies and de-listings have whittled that number down to eight. 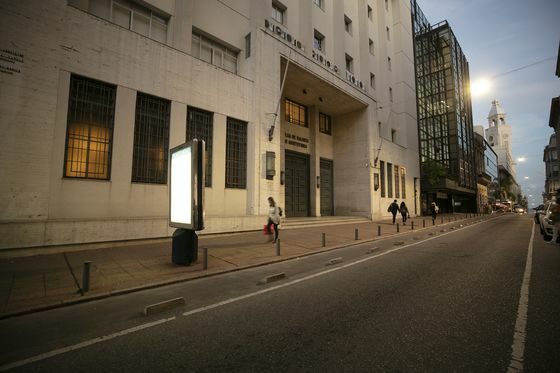 A few blocks away, the rival Bevsa exchange owned by the country’s banks accounts for more than 90 percent of securities trading in Uruguay.